Mitchell Johnson lines up to bowl at the Cathedral end of the new-look Adelaide Oval. A slow clap resounds from the western grandstand of the partially redeveloped complex, in support of the Australian fast bowler. English captain Alastair Cook responds to Johnson’s head-high bouncer with a hook shot, but is caught by Ryan Harris at fine leg. The crowd’s applause quickly turns to a roar as Harris tumbles, recovering from his catch. Eyes move to the historic scoreboard where the numbers are rotated manually to show that England is now one-for-one, chasing 531 in its second innings of the second Ashes test. In a time where built heritage is too often neglected in preference of development, the century-old scoreboard stood earlier this week as a reminder of the Oval’s tremendous antiquity and the cultural significance of this place. The century-old Adelaide Oval scoreboard remains standing amongst the 21st century development and technology. 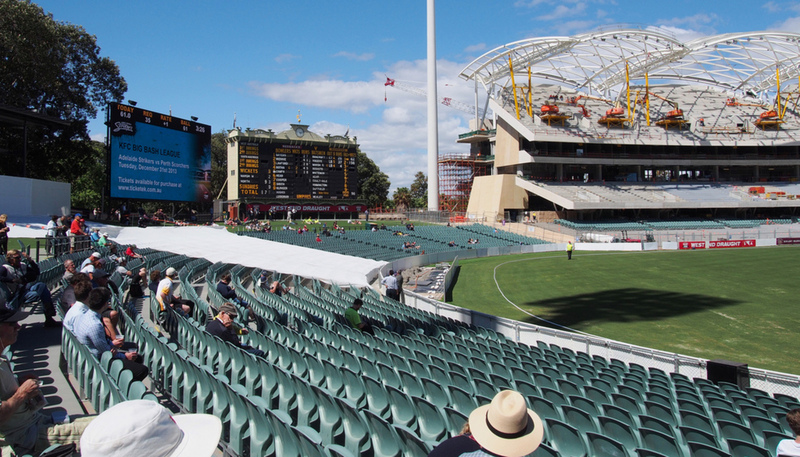 As part of a A$535 million collaboration between the Government of South Australia and the Adelaide Oval Stadium Management Authority (AOSMA), the Adelaide Oval has been undergoing a major facelift since 2010 to bring its facilities into the 21st century. The Oval will once again be the home of sport in South Australia: international and local cricket matches will be fought on the same turf as AFL, which is leaving AAMI Stadium behind in 2014 in favour of the modernised ground. the ground is no longer an iconic cricket ground, it’s turning into a generic universal stadium that could be anywhere in the world. The new western grandstand. You can see part of the original George Giffen stand in yellow directly between the upper and lower levels. What has been removed and what remains? 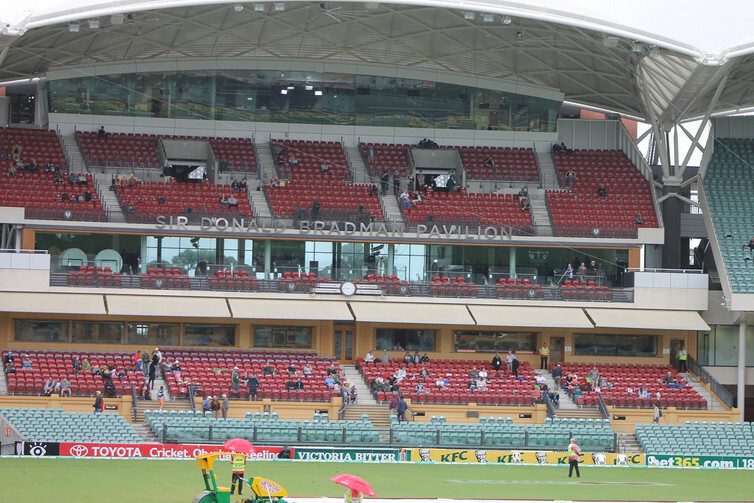 All pre-2010 stands at the Adelaide Oval have been demolished, including most of the George Giffen, Sir Edwin Smith and Mostyn Evan stands, which are listed on the SA Heritage Register. Parts of those stands remain, including the red brick archways and the centre of the George Giffen stand, which make up a portion of the new western grandstand. The heritage-listed manual scoreboard, designed by renowned South Australian architect Kenneth Milne and erected in 1911, remains standing at the northern end of the complex, flanked by the famous grassed northern mound and Moreton Bay figs. Pacifying those with a desire to have the most up-to-date technology, the old scoreboard is complemented by a new video screen that has been erected directly beside it. The heritage features of the Oval sit effectively within the newer structures to create a scene that is both contemporary, yet uniquely Adelaide. All pre-2010 grandstands (some were listed on the SA Heritage Register). Victor Richardson Gates (local heritage listing, to be re-installed after construction work has ceased). Scoreboard (constructed 1911, confirmed as a State Heritage Place in the SA Heritage Register, 1986). Parts of the George Giffen (constructed 1882, redeveloped 1889, 1929), Sir Edwin Smith (constructed 1929) and Mostyn Evan (constructed 1929) grandstands (collectively confirmed as a State Heritage Place in the SA Heritage Register, 1986). Northern mound and Moreton Bay Fig trees. Has Adelaide Oval lost its cultural significance, as feared by the National Trust (SA) and Oliver Brown at The Telegraph? Or should the oval go one step further, as proposed by Bernard Humphreys at The Advertiser, and remove the old scoreboard? In my view, the scoreboard must stay at the Adelaide Oval. Removing it from this place will mean that it loses all of its cultural significance, even if it is moved to another venue, such as the Thebarton Oval. Structures of this sort do not become culturally significant and “mean” something by themselves. People give them meaning; stakeholders give them meaning. Our collective experiences at Adelaide Oval, such as the one illustrated in the first paragraph of this article, make such structures significant. Removing the scoreboard will mean the intangible heritage of Adelaide Oval will be lost and so too will the meaning we give to it. Only when features such as the scoreboard, the Moreton Bay figs and the remainder of the historic grandstands are removed will Adelaide Oval become a “generic universal stadium”. That does not look like happening any time soon. “Development” has become synonymous with “destruction” in conversations about heritage in recent years. But there is an opportunity to harmonise heritage and development, and AOSMA has demonstrated this successfully. As well as retaining the heritage features of the Oval, AOSMA has managed to create a state-of-the-art sporting and entertainment venue that will allow South Australia to attract major international events and, in effect, boost the state’s economy. Save for cricket season, over the summer, and the odd concert, Adelaide Oval was underused and neglected. This was to be its future and its legacy had this redevelopment not taken place. Now, with stands that will be able to accommodate up to 50,000 people once the project is completed, greater parking and public transport facilities, and the AFL moving back, AOSMA and the South Australian government have breathed A$535 million of life into Adelaide Oval and the state of South Australia. The example that AOSMA has set can be put to use at other historic heritage places – so long as the needs of the key stakeholders are met, heritage experts are consulted and the cultural significance of the place is not compromised.